Not only were they virtually unable to buy land, but the diggers were denied both land for agriculture and tenure over the plots on which their tents stood. Some considered this the most serious injustice against diggers and the one which would most retard the colony’s development […] How could the colony hope to retain the tens of thousands of enthusiastic immigrants, whom it had been trying for years to attract, if it withheld the means of a secure, prosperous future- land? Annear, R 1999, Nothing but gold: the diggers of 1852, Text Publishing, Melbourne, Vic. The government’s steep licence fee was designed to discourage unsuccessful diggers and send them back to their professions. But poor financial management by La Trobe's administration meant that the government relied on the money generated by the licences. The £600,000 each year was a major source of capital for the colony. The salaries of the commissioners and the cost associated with mounted police, public works, roads and the postal service all pushed the colony's budget out of balance. The best chance to reform the system came in 1852 when the Colonial Office in England officially authorised the colony to make decisions about the goldfields — to this point all decisions had to be cleared with England. An export duty was proposed that would increase the amount paid on gold leaving the colony. The council voted against this suggestion, thinking that this would encourage smuggling across the South Australian and New South Wales borders and that it would require physical searches of all men. This reform might have prevented the Eureka Stockade. Only successful miners would have paid the tax instead of all miners being charged whether they were successful or not. In short, just when Hotham arrived, the crazy commercial structure of the colony was tottering over. Goods from overseas were still pouring in and could not be sold. Imports in 1854 were even greater than in 1853, and despite gold production, in the two years the value of imports exceeded exports by no less than £10 million [...] Hundreds of shaky import firms went down like ninepins; late in 1854 and early in 1855 there were about four hundred insolvencies and thousands lost all their paper gains [...] Unemployment mounted, especially in the building industry, and thousands were forced back to the goldfields. Government retrenchments in public works and staffing made the immediate situation worse. 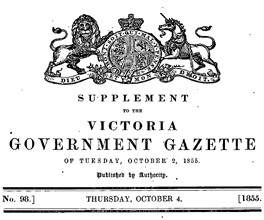 Serle, G 1968, The golden age : a history of the colony of Victoria, 1851-1861, Melbourne University Press, Carlton, Vic. In 1853 and 1854, more and more diggers and business operators failed to pay for their licences. Hotham's increase in checking licences caused mounting tensions. It took the events of the Eureka Stockade to bring about the abolition of the license system. The new Miner’s Right was only £1 per year and an export duty on gold was finally introduced. Miners gained the right to vote and were allowed to buy land in the areas where they were mining.